My Anthropologie inspired dollhouse is done. It was a lot of fun to make! 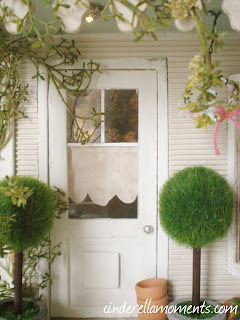 I found the topiary trees at Michaels craft store. They are place card holders from the wedding section. The house is covered with concrete. This side and the front have siding made out of corrugated cardboard. This side is just concrete. 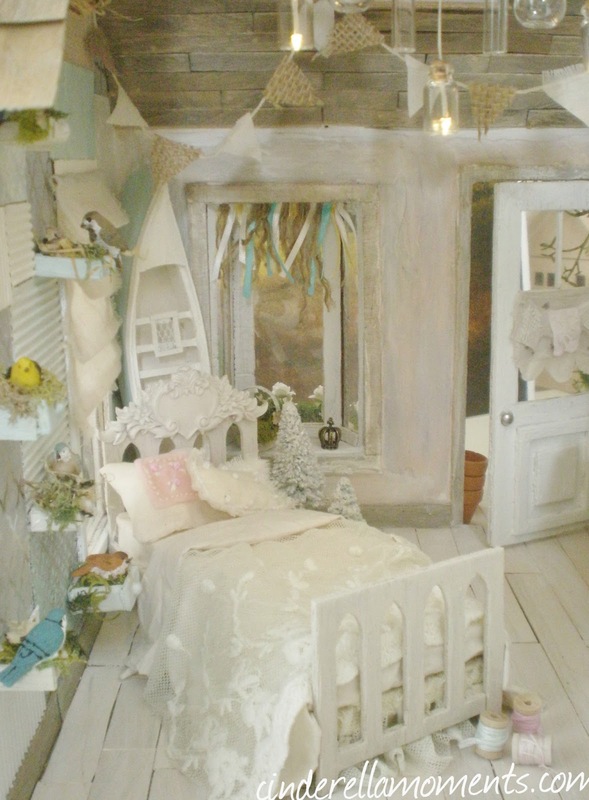 I got the 3D effect of the white trim by putting thick cardboard and then covering the entire thing with concrete. 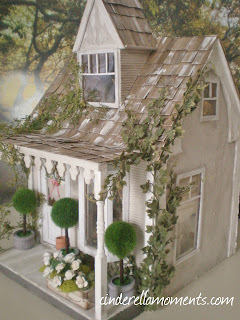 I painted the trim white, the body of the house is puddy colored(tan) and I aged it. I made my little window crooked. I really wanted vintage character for this house. 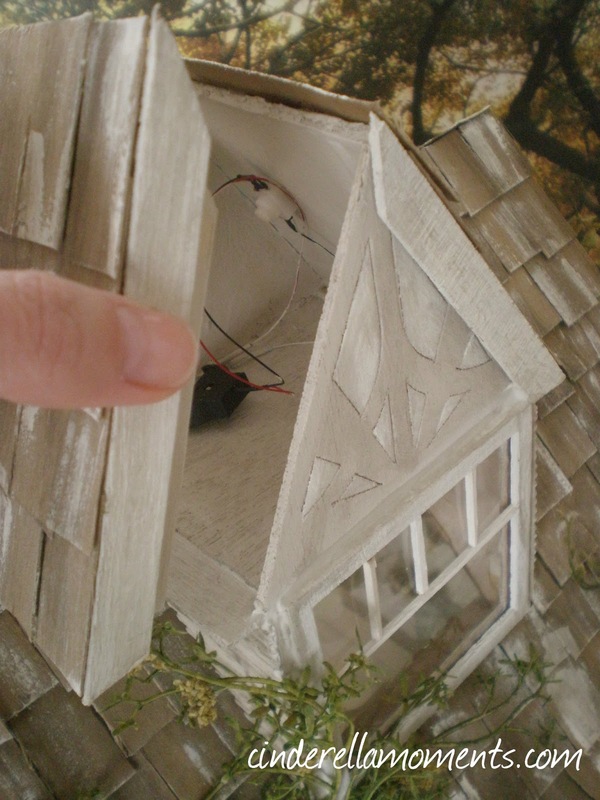 The battery and switch are in the dormer roof. The interior was dreamy to work on! I made the bed from 2 pieces of fencing. 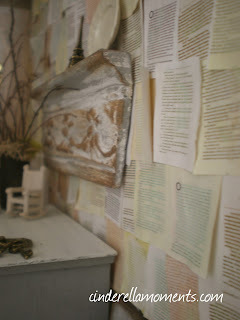 And I decorated it with a scrapbook plaster decoration on the headboard. The bedding is just bits of muslin and lace I had left over. I did a little needlepoint embroidery on the pillows. I found a canoe at Hobby Lobby. It was too cute to pass up. 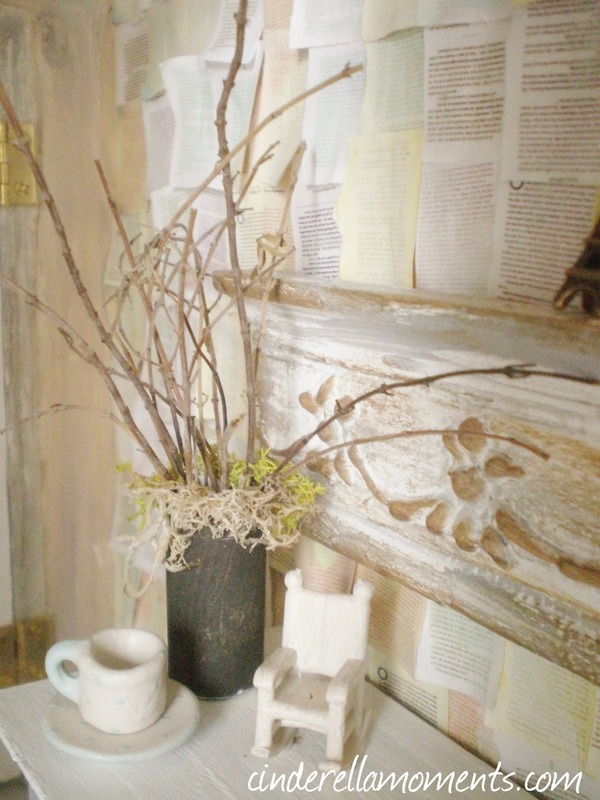 I painted it blue and cream and placed it behind the headboard. I had to put a couple of glitter trees in there too. 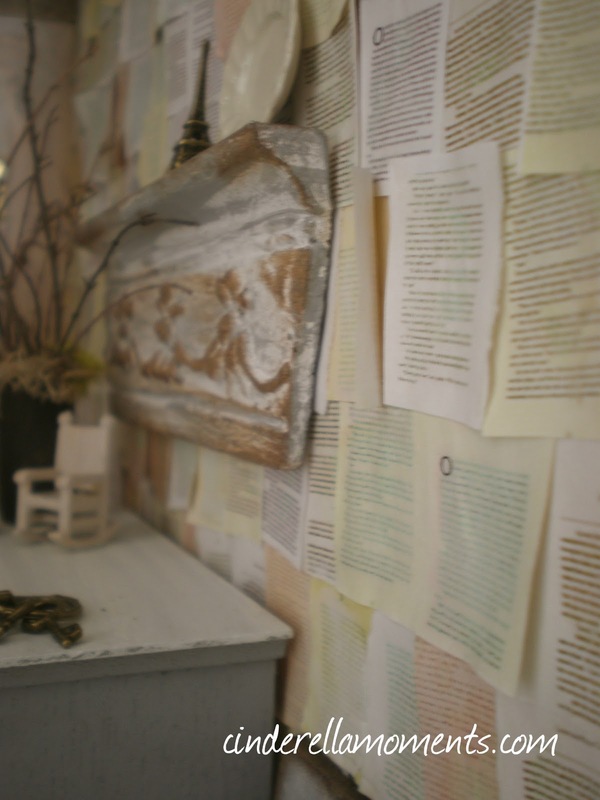 The wall of book pages is so perfect for this house. The idea came from A Well Dressed Home. 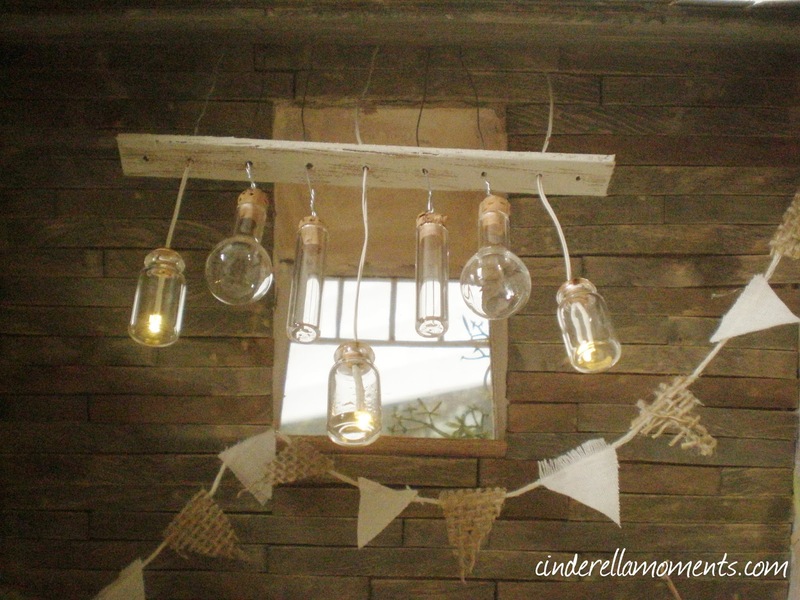 My jar chandelier is my favorite light fixture I've ever made! 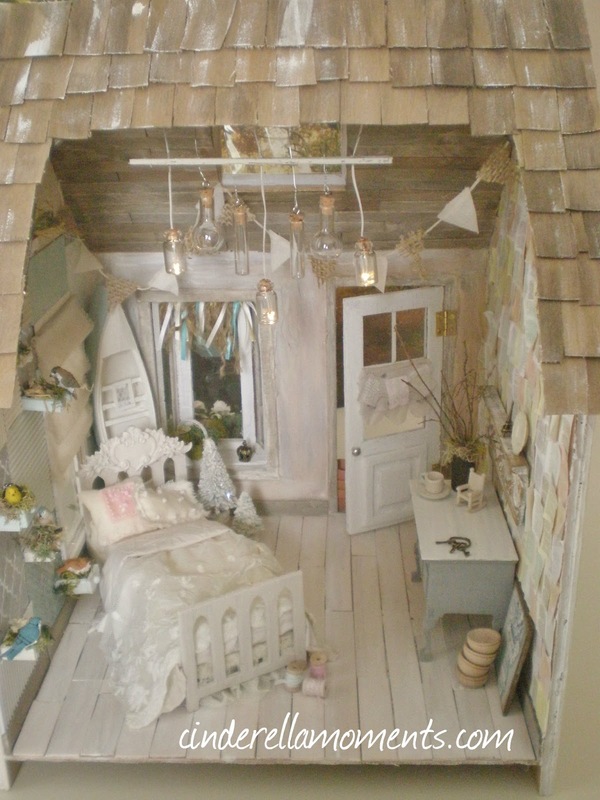 The Anthropologie Inspired Dollhouse is Musette's future home. Thanks Rella! Que cosa mas hermosa!!! Es tan bella y romantica. Cada uno de los detalles que hiciste son realmente fabulosos. Estoy enamorada de tus trabajos!! 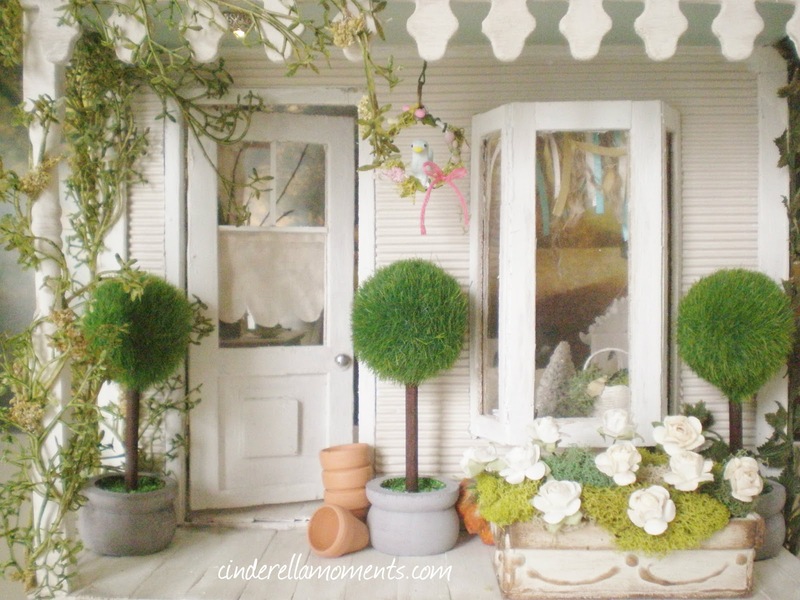 Oh I love this little cottage! This has to be the prettiest house ever! Oh, it's a beautiful house. It is the abode of fantasy and joy. Happy New Year! Es preciosa, cada una de las casas que haces me gusta más! 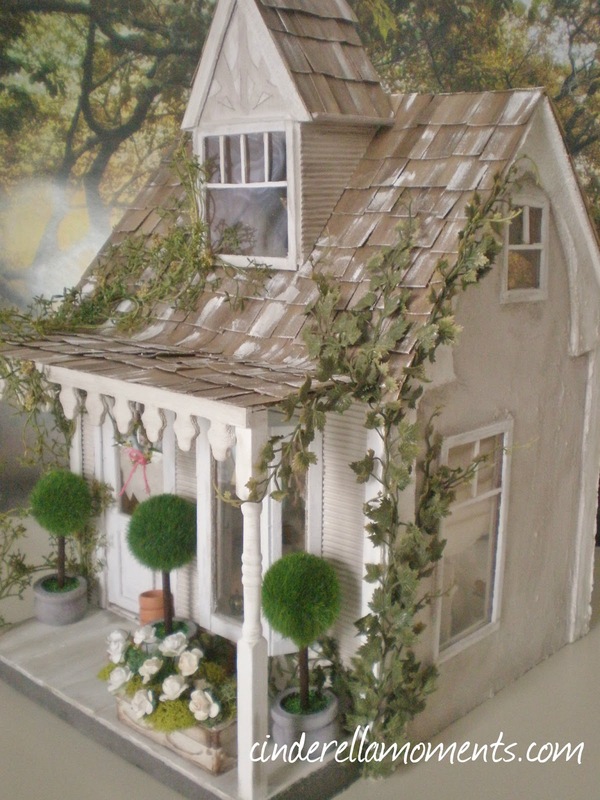 This is a very beautiful cottage, I really love every bit of it, Caroline! Great work! 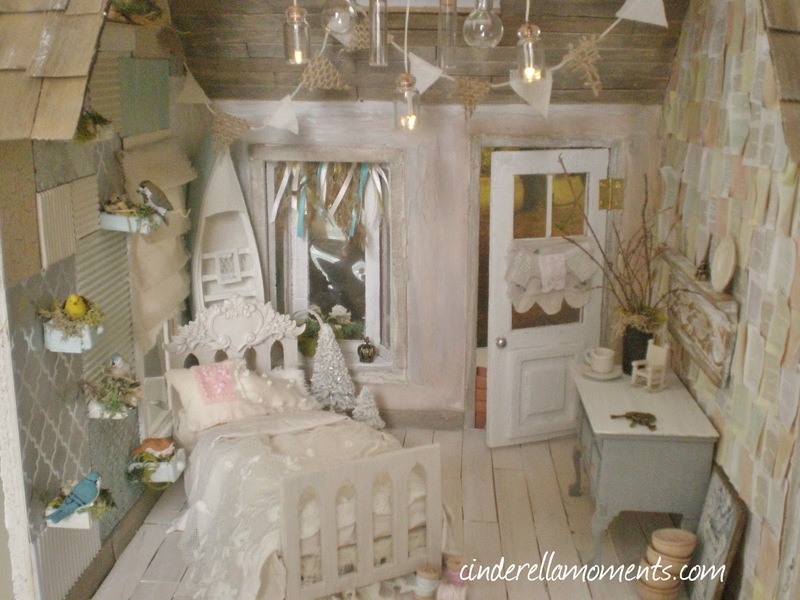 The whole atmosphere is so dreamy and the color scheme is gorgeous! Wat een beeldig huisje heb jij weer gemaakt. Another beautiful little shabby cottage! Your ideas are wonderful and so cozy. Love the bed! 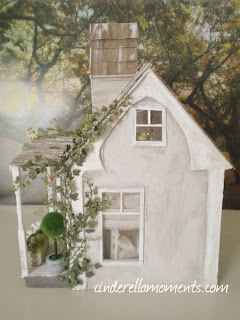 Wish I had time to make another little house. 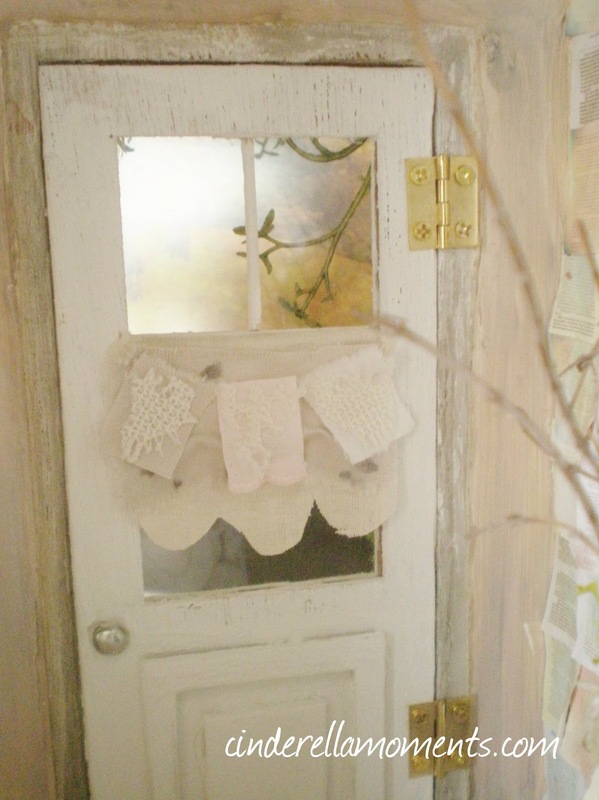 It is a very charming house. I love everything outdoors. It looks so warm and cozy. The little bird is so cute. So nice. Well my friend, you have out done yourself on this one. I love the bed!! The front porch is amazing. Wow Caroline! I love this house. It's simply beautiful inside out. Again one of your masterpieces.. So cute...those trees are great. The whole house is great....wauw!! Дорогая Кэролайн. Ты такая талантливая!!!! домик восхитительный, и как ты все успеваешь))) а какая чудесная идея с освещением! такие баночки симпатичные!!!!!! А стульчик мини, здорово!!!!!!!! Люблю твои работы!!!!!!!! I love it, Caroline! I especially adore that little bed. Of course, everything in that little house is endearing. I don't know how you do it. I can only conclude that yours is an exceptional talent. This house is a real dream. I love it. Como siempre has hecho una fantastica casita. Me encanta el detalle de la lampara de botecitos, genial!! Me encanta la pared con las hojas de libros. 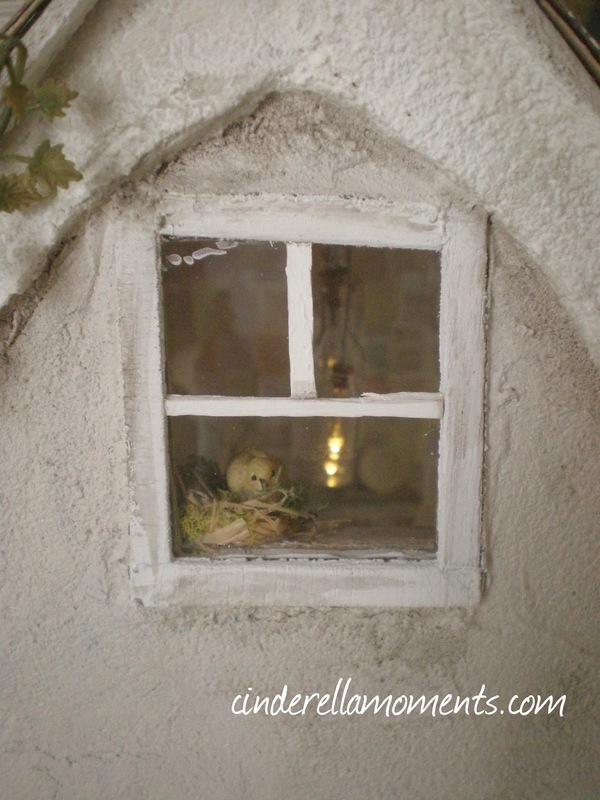 The bird at the window is adorable. I love the way it turned out! So soft and romantic. It looks like lots of tender loving care went into making it. Toatlly amazing Caroline!! 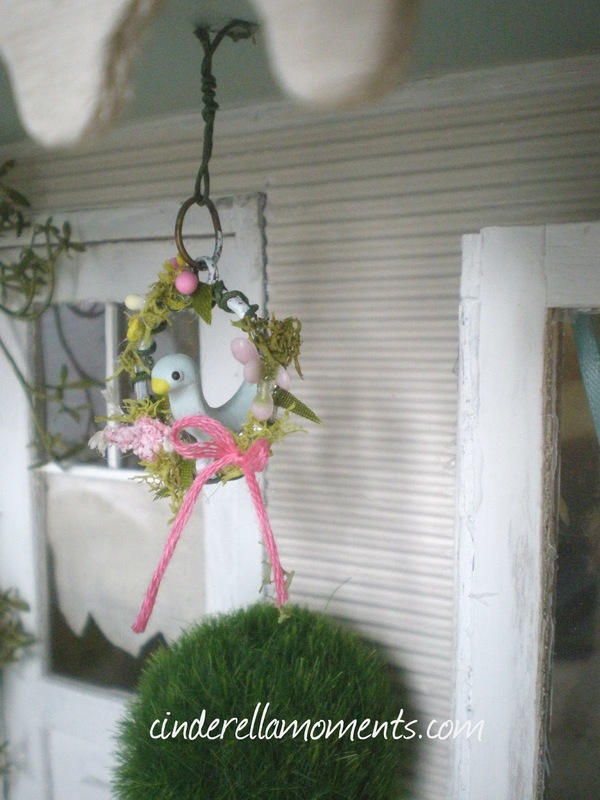 I love the little wreath with the blue bird :) Everything about this house is divine!! Wow Caroline I love this darling house. Its magical inside and out. 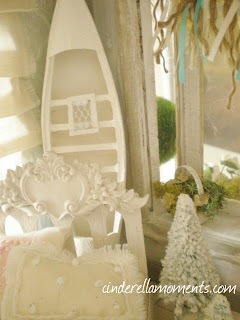 I love the bed and the boat is a fantastic idea. The chandelier is amazing and perfect in this cottage. I absolutely love this house - everything about it but especially the chandelier :) I so wish I could see this in real life :) It is stunning and so beautiful. It leads one to think the spring as something close, even though we are in the middle of winter and flu, from which I am afflicted, to be precise! Me entusiasma cada uno de tus trabajos,esta casa es perfecta y acogedora en todos sus detalles,un nuevo trabajo fantástico!!! Es preciosa, la lámpara y la pared forrada muy originales. LOVE everything about this house. The soft color palette. The warm and inviting feel. 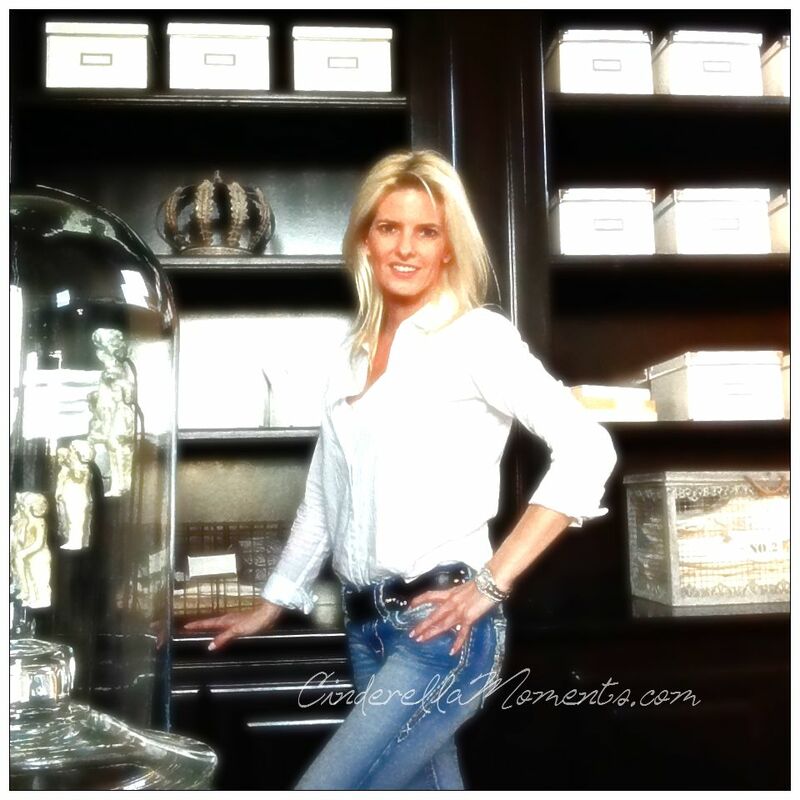 The eclectic vintage style. And of course....the jar chandelier! It's all completely fabulous! 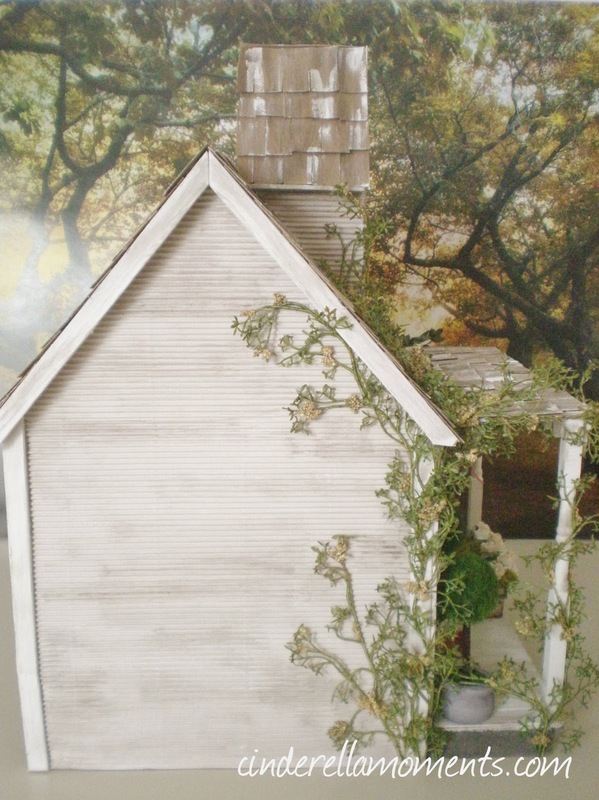 This little house is pure poetry. I like every detail you've done. As always, your job is just absolutely wonderful. Es preciosa me encanta. La cama es una verdadera preciosidad. 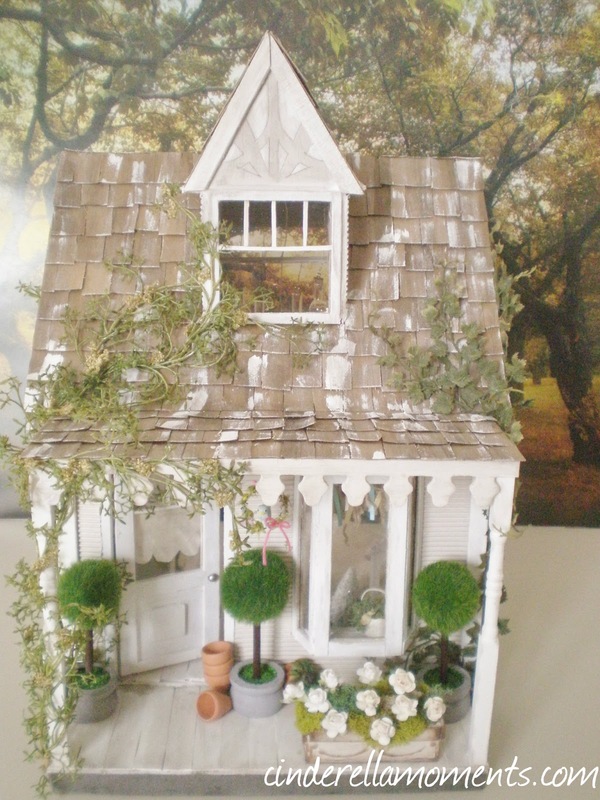 Wow Caroline, you have out done yourself with this entchanting cottage, I love it !!! There are sooooo many lovely details. but I fell in love with your jar chandelier, it is gorgeous!! Oh! Your house is sooo amazing! I´ve been so inspired now! I want to make one in this style also =) very very pretty! preciosa!!! no conocia tu blog y he pasado un rato fenomenal visitandolo, ya tienes una nueva seguidora!!! Aprovechaste muy bien el espacio y los colores tenues le dan luz y transparenia. Oh my goodness Caroline you did it again and then again.....your creations are truly amazing hon. 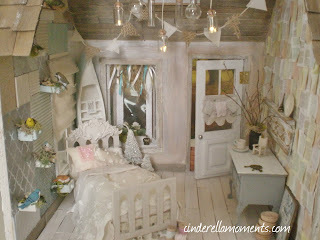 You've combined my two favorite things dollhouses and Anthropologie! I haven't been in the mini world for awhile. Love all the things you've been doing! Im thinking this is my favaourite! I love the tiny birds anything with Birds and butterflys just get to me, oh its gorgeous!